Winter is moving on. We have had a lot of lovely snow here, while in England they suffer under torrents of rain, day after day. I wonder if the suffering was as great in 1811? This I do know, fashion's changes were getting underway once again, since mourning for the Princess Amelia was over. Where in January all was black, gray, scarlet, and somber, this month sees color creeping back in along with plays and operas and entertainments. Since it's still cold, we hear about quilted tippets and long sleeves, but apparently the sable tippets are discarded. This is damp London, after all, not frigid Weimar, where the fashionables are layering their furs. Yet these were not the only changes. After much tension and argument, the Prince of Wales was formally installed as Regent, and King George III ceased to hold the reins of power. He had hardly done so for some while, being ill with an acute disease scholars now think may have been porphyria, and that could have been caused by arsenic poisoning. At the time, he was said to have gone mad. Let's have a look, then, at this month's La Belle Assemblée. Gentle reminders: the magazine reports on fashions one month ahead, so the February issue remarks on fashions for March. Plus, don't forget to read the London report from Ackerman's, and those from Weimar and Paris! The comparisons are really interesting. This month we have two articles over two pages, nos. 100-101. The articles are transcribed below, followed by my few notes and questions. A gown of plain white India muslin, made loose in the neck, with long sleeves, and short train trimmed with a fancy border of stamped leaves in satin. A white satin cap, ornamented with crimson or morone coloured flossed trimming. A short Persian scarf of morone coloured silk, with rich border and tassels, is fancifully worn over the shoulders. Amber necklace and earrings. Hair in full curls, divided rather towards the left side. Gloves and shoes of white or morone kid. 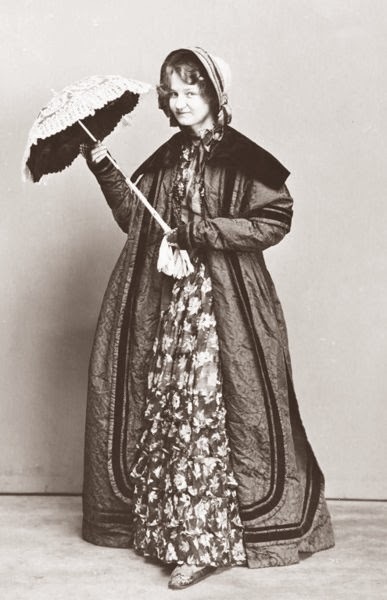 A bias corded muslin dress, a walking length, with long sleeves, made high in the neck, with collar; buttoned down the front of the waist with narrow lilac satin riband. Sash tied in a bow in front; a border of plain muslin, or lace, round the bottom. A square of lilac satin, with richly embroidered border in white silk, and tassels to correspond, is thrown over the shoulders in the form of a shawl, and is cut down the back to give it a more easy and graceful appearance about the figure. A simple white chip hat, tied round the crown in a bow in front of lilac satin ribband. The hair in full curls over the forehead. Pearl earrings. Gloves and shoes of pale lemon, or lilac-colored kid. 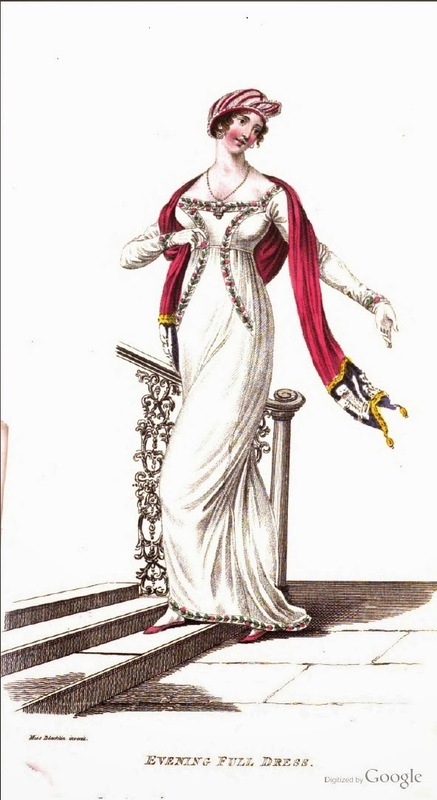 Morning carriage dress, La Belle Assemblee, February 1811. 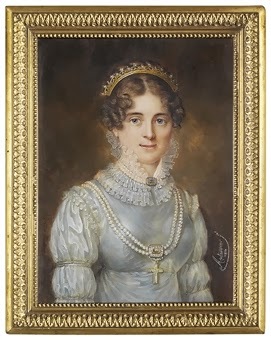 The mourning for the late Princess Amelia expired on the 11th of last month, but though not general, the Court continued it in a slight degree for the deceased Queen of France. Sables are at length, however entirely laid aside, and notwithstanding the season of Lent is not usually distimguished by much of variety, gloom seems to have subsided, and gaiety and fashion fast entering on spring. For the promenade, scarlet mantles have been so general during the mourning, that for mere variety they must now be laid aside; we think they are more frequently succeeded by the short pelisse of purple velvet, trimmed with broad black lace, or small cottage mantlet, lined with white sarsnet, ornamented with white chenille or gold. Purple sarsnet pelisses, or black velvet, lined with colours, are equally approved. Cottage bonnets, cloth turbans, or small velvet caps, and one long drooping ostrich feather, or two small ones, are most prevailing; under the cottage bonnects, which are formed to set off from the face, small lace caps, rosettes of lace or ribband, or small flowers, are much worn, with a deep black French veil thrown over. Purple, black, or scarlet boots, are universal for walking. For morning dress, short pelisses of cambric corded muslin, over a slip of the same, trimmed with edging, or made in poplin, bombazeen, or lustres, with ruffs and cuffs of fine clear muslin, with bands of the same, and clasps of "lope de pêrle". Dinner dresses are most worn in lustres, sarsnets, Opera nets, or cloth, made up to the throat with lace cuffs, collars and small French aprons of lace, or fine embroidered muslin; and lace or quilted satin tippets, trimmed with swansdown, or white chenille. much to be preferred to the ridicule so long in vogue. 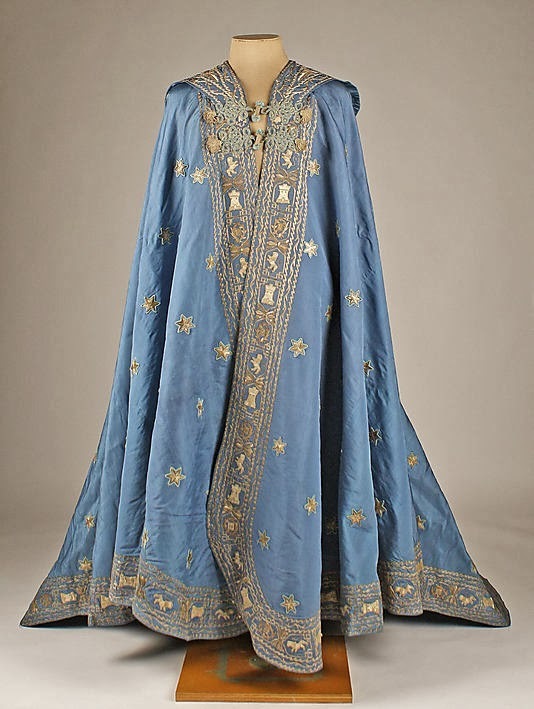 For the Opera, blue or white satin short pelisse, trimmed with deadsilver or gold; with massy gold chains and bracelets, brooched with emeralds or amethysts, and ?? to correspond; and gold or silver bands or nets for the hair, which is dressed in full, large, round curls over the face, and divided on one side by a diamond, pearl, or ornamented comb. Hair knots are just introduced, in embroidered lace, with gold or silver thread, forming a light rosette, to be disposed among the hair according to fancy. Short dresses, or draperies of coloured net worn over white satin, embroidered with coloured silk, silver, or gold thread, form very pretty full, or dancing dresses. Long sleeves are as general as ever; the neck is always shaded by lace or satin tippets, trimmed with gold. In respect to jewellry, the most fashionable combs are made in gold set with lope de pêrle; bands for the hair are made in the same, set in gold, as are necklaces, bracelets, brooches, and earrings. Garnet rings are much admired, set in gold after the antique. Watches are worn very small, thickly and richly embossed; in short, nothing is admitted to be novel in jewellry that was not worn some hundred years back. The prevailing colours are lavender, faded violet, silver, grey, purple, plum, and crimson. Rather than use footnotes, when can become cumbersome, I am highlighting items of interest in boldface, and then defining or commenting on them, as needed. Bombazeen (bombazine): "a light silken manufacture used for mourning". From Barclay, A Complete and Universal English Dictionary. The fabric was generally in a twill weave (look at the weave in a pair of modern jeans and you'll see an example of a twill weave), generally in black. Sometimes the fabric was made of all silk, sometimes in a silk warp and a worsted wool weft (Encyclopedia Britannica). Nankeen boots, from the Lady's Repository Museum. Boots Footwear, often made of fabric rather than leather, reaching above the ankles. At this period boots and shoes often matched or complemented other parts of the outfit. Usually worn outside, as in February 1811, La Belle Assemblee: "Purple, black, or scarlet boots, are universal for walking." See an extant example of walking boots, in nankeen, from Rachel Kinnison's collection. 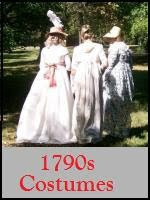 You can read about them on her blog, too, at http://ladysrepositorymuseum.blogspot.com/ 2013/02/ladys-1810-1820-nankeen-walking-boots.html. Colors this month are still in the purple and red range, perhaps due to winter or perhaps due to the lingering feeling for mourning. "Cottage" seems to be a common descriptive term: we have cottage mantles and cottage bonnets. 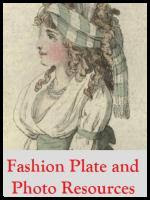 So far I am unable to locate extant examples or fashion plates of them, but this may change. deadsilver Appears to have been a matte silver metal thread used in weaving and embroidery. It was used in conjunction with "bright", shiny silver. See for example "A dress of transparent net, worked in bright and dead silver" in Robert Huish, Memoirs of Her late Royal Highness Charlotte Augusta, Princess of Wales. Also "Evening primrose satin petticoat, with flounce at the bottom embroidered in burnished and dead silver". 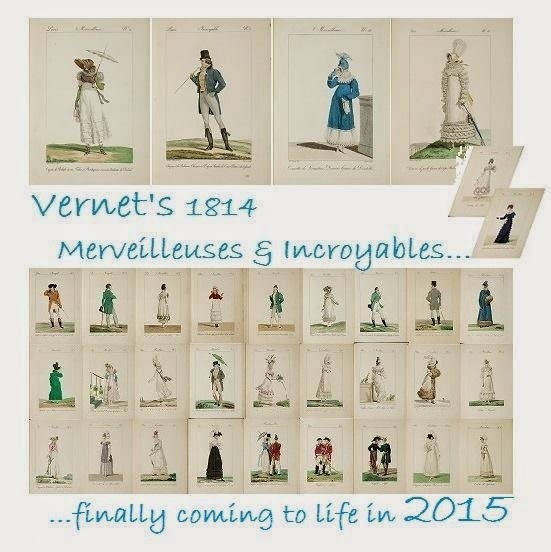 In La Belle Assemblee, June 1816, "Her Majesty's Drawing Room". "Dead silver" is also a term for silver during one part of the ore's preparation for use. When burnished, dead silver took on the familiar highly polished, bright and shiny look. See Ure, Andrew, A Dictionary of Arts, Manufactures, and Mines..., Volume 2, 1853. P. 643. Sadly, because silver embroidery tarnishes so easily, it all begins to look black, so it's hard to know, when looking at embroidered extant articles, what might once have been bright versus matte. lope de pêrle This term occurs twice in this month's pages, and each time it's misspelled. The French term is actually "loupe de perle", and it means, roughly, pearl bits and pieces. In German, the term is "Warzen", which means wart. Well, well, warty pearls, now known as mobe or Baroque pearls, are misshapen, often covered with bumps and indentations, and often flattened on the back. I believe the term can simply apply to a rounded pearl with a flat back. What the article is suggesting is that jewelry with little half pearls set into into it was fashionable. Little flat-backed pearls would be less expensive, and could be set into a ring around the edges of a clasp, or into the filigree of a tiara or comb. Thank you to Alessandra, for translating the term correctly, and to Sabine, for finding that indeed, such were used in jewelry, per Johann George Kruenitz et al, in Oeconomische Encyclopädie oder Allgemeines System der Land-, Haus- und Staats-Wirthschaft: in alphabetischer Ordnung, Band 108. (Google Books), p. 574. Young lady. Louis-Marie Autissier, 1814. Note the clasps on her pearl necklaces. 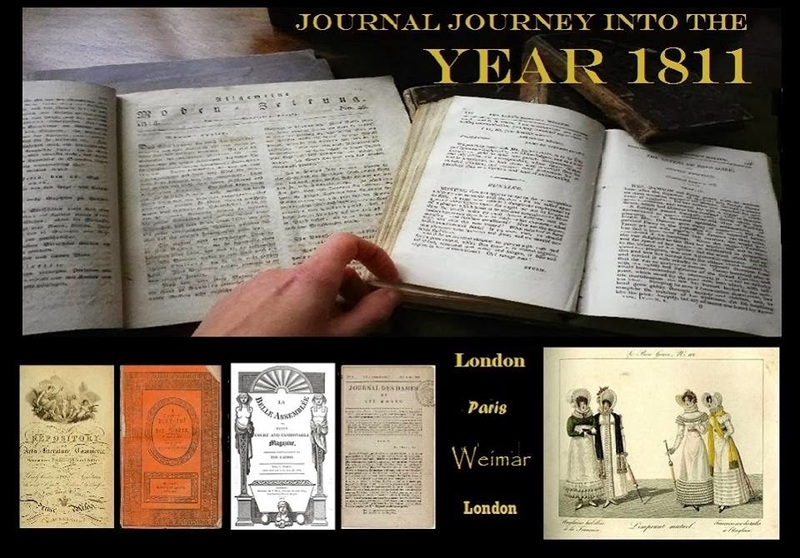 http://ladysrepositorymuseum.blogspot.com/ 2013_08_01_archive.html. See also lustres, above. Mantle What is the difference between a mantle and a cape? It is hard to say. The Victoria and Albert classifies the long cape-like garment from circa 1820 as a mantle, and the Metropolitan Museum of does the same for a an amazingly ornate example from around 1806.
into revers, and there are two capes. but no revers per se. Morone Could this be "maroon"? Or is it chestnut colored? Marron is French for chestnut and in German, marone means chestnut as well. Maroon is a reddish-purplish color, but I wouldn't call it chestnut, exactly; chestnut is reddish-brownish. The plate shows a purplish color, but of course the color as painted may a) not have been painted to match exactly, b) the original paint may have oxidized or faded and/or c) the computer could have changed the color. I've been unable to locate this color in French or English dictionaries between 1790-1820, but have not looked through all of them available online. Neither "maroon" nor "marone" appears. SO much -ish-iness here, can you tell I am unsure-ish? Ridicule Alternative and sassy term for reticule. Use for instance in La Belle Assemblee, February 1811, "small aprons of rich antique embroidered muslin with full pockets drawn and ornamented with white satin ribband, have an exceedingly elegant and novel effect, and are much to be preferred to the ridicule so long in vogue." Tippet Just as they were in Jnuary's issue, tippets are still hot, but their materials vary. Tippets made of sable fur are out, while satin or quilted satin ones trimmed with swansdown or white chenille, both nice fluffy substances, are in.